A General Motors collision repair expert said last month that the OEM’s free auto body repair procedures site was not enough to correctly repair a vehicle these days — a shop is going to have to purchase a subscription to the comprehensive GM service and repair site to do the job right. The need for mechanical and other repair information contained on the pay site has grown so great that GM is even considering deleting the free site, as its existence might mislead shops into assuming everything they need for a proper collision repair exists there, GM body structure service engineering advanced serviceability of design team leader Bob Hartman indicated last month. Right now, the free site doesn’t even have all of the repair procedures related to a body-on-frame vehicle’s frame, Hartman said. While sectioning details are available within the free auto body repair procedures, other frame-related topics like brackets might not be, he said. Hartman said he was “working now” to have the full chassis instructions on the free site, but for now, a shop relying solely on the free site will lack some of the frame details they might need. Directions related to airbags, hybrid vehicle safety, and all the diagnostics and calibration that are hot topics in collision repair today aren’t present either on the Genuine GM Parts free site, only the ACDelco paid site. While a warning related to welding too close to a sensor on a bolt-on part might exist on the free site, procedures related to the actual sensor would only exist on the pay site, Hartman said. Hartman said about 15 years ago when GM first gave out free collision repair procedures, it was enough. He said he could be comfortable a shop could make a full repair with just those free procedures. “Today, you can’t,” he said, and earlier observed that “I can’t stress enough” the difference. Hartman described it as “on the top of our radar” how to handle the need for today’s auto body shops to use the paid repair information. One option might be to grant access for free to shops on GM’s upcoming certified collision repair program, he said. 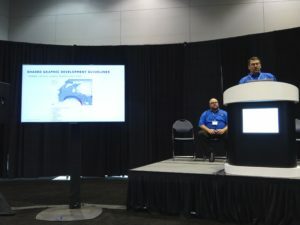 The collision repair industry was on the whole “lagging behind” the mechanical repair industry in being informed on technical matters, he said. “We’re trying to move that mountain,” he said. Even the bolt-on fascia on a modern vehicle can have sensors, Hartman said. The free site was “not enough” to repair “today’s generation of cars,” he said. Even a minimal auto body repair would “almost need the pay site,” he said. “It’s not everything,” Hartman said of the free site. 10-12 years ago, some advanced technology was relevant to a proper collision repair, but it was “a lot different back then.,” Hartman said. Back then, “we were happy” just that the technician bothered to look up the free repair procedures. “Today’s generation of cars, it’s not that way,” Hartman said. In addition to the complete, bumper-to-bumper content necessary to fix a vehicle correctly, collision repairers subscribing to the GM pay site also receive the full-function version of the collision repair procedures. Links sending a repairer to related procedures and directions are active on the paid collision repair instructions, allowing a tech to easily reference those other documents. The free site has no active hyperlinks, the blue, underlined text in its pdfs indicating a functioning, clickable hyperlink is just inert, unclickable text. Using the paid site therefore seems as though it’d cut down the time necessary to research procedures and the prospect that something would get overlooked. Hartman said GM is also considering short collision repair videos to enhance the paid site and demonstrate procedures to techs; news on this might be coming as soon as SEMA, he said. While making life easier for a shop, the paid collision repair site still demands a certain level of common-sense logic by a technician. 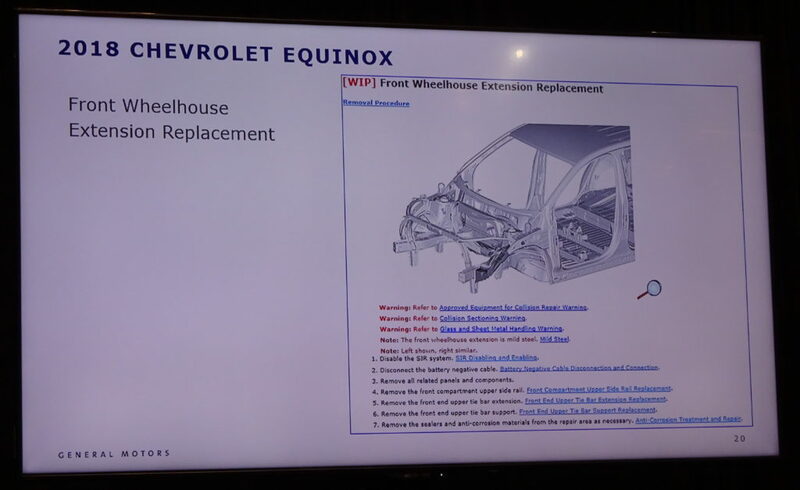 GM doesn’t link to bolt-on parts on either the paid or free collision repair site when describing a structural repair; it assumes the tech will know to remove those elements and think to look up steps related to those items or, say, a sensor upon it. Like GM, FCA provides auto body repair manuals for free, but charges for all other service and repair instructions — and it seems like the concerns discussed here would apply to shops fixing its cars as well. While we love GM and FCA’s free content and hope it persists as an industry resource — it’d be like having a more extensive version of Honda’s free Body Repair News industry heads-ups — it seems that a shop wanting to fix both OEMs’ vehicles responsibly in 2017 must ante up for the two full sites.